Introduction. Blancmange is one of the oldest sweets of the Sicilian tradition. Soave, elegant and as pure as a child’s smile, this deliciously creamy dessert dates back to both French and Arabian dominations. In the middle ages the Normans brought ‘Blanc Mange’ to Sicily, but here they found something better than just ordinary milk to make their dessert with: almond milk, introduced a few centuries previously by the Arabs. How to prepare almond milk. Bring a pot of water to the boil, turn off the heat and immerge 250gr of sweet almonds and just a few bitter almonds. Leave to soak for three minutes, drain the almonds and peel off the dark brown skin. Soak the peeled almonds in 1l of water at room temperature with 50gr of sugar for 3hrs and then blend the almonds and their sweetened soaking water in an electric food processor; leave the mixture to rest for another hour. Extract the white liquid by filtering it through a linen cloth, taking care to wring it well in order to extract the almond oil too. You can throw away the pulp: your almond milk is ready! How to prepare Blancmange. Put a little almond milk in a cup and dissolve the starch in it. Heat the rest of the almond milk gently and add the rest of the sugar, the starch solution and a little grated lemon zest. Stir slowly and take the pot off the heat as soon as the mixture starts thickening. Keep stirring well and pour the hot mixture into little bowls. When they have cooled down to room temperature, place the bowls in the fridge. 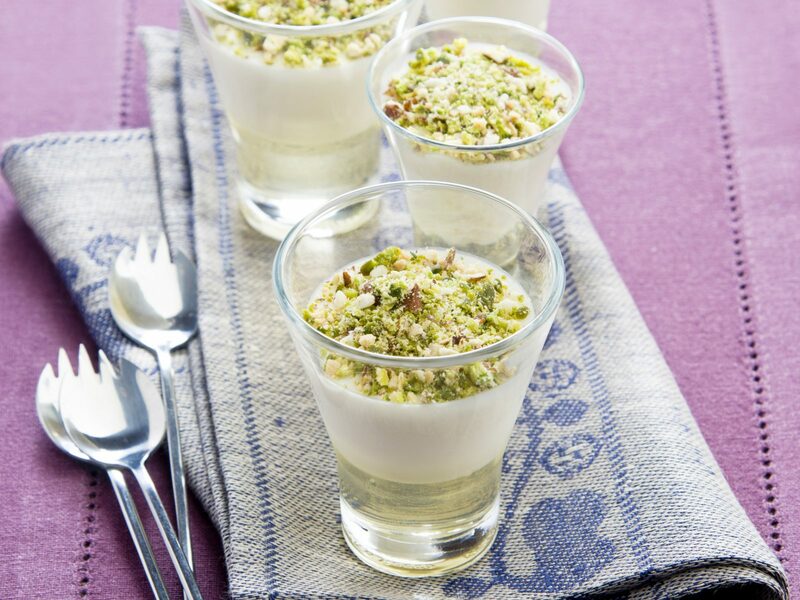 When cool and dense, decorate with chopped almond and pistachio.